In nature photography, and in particular butterfly photography, the result of a great shot is often a combination of knowing the subject, its habitat and environment, lots of patience and a good dose of luck! At times, it also depends on the photographer's ability to "see" beyond the obvious, and create quick compositions in his mind's eye, whenever an opportunity presents itself - even for a fleeting moment. In this case, the artistic quality of this shot far outweighs the butterfly itself, because a photographer can seldom dictate the pose of his subject, nor determine exactly where it will land. The three curved leaves of the ferns draws the observer's eye towards the left and beyond the frame of the shot, but the subtle intersecting overlaps of the leaves suggest that they belong to the same plant, even though the main plant is out of sight. 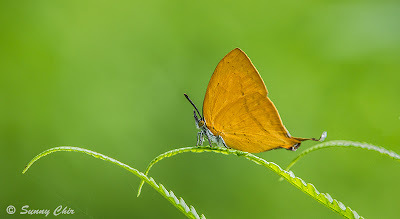 The butterfly sitting on the middle leaf gives a well-balanced composition to the shot, whilst its facing towards the left aligns with the directional curves of the leaves towards the left of the frame. The contrasting orange butterfly on the lime green background presents an eye-pleasing colour combination. A well-executed shot by ButterflyCircle member Sunny Chir. Never mind that the butterfly itself has lost one of its tails. In a perfect world, that would have been the icing on the cake that would make this an award-winning shot.